Time Control: G/45 with 5 second delay. Entry Fee: $20 WCC members, $30 non-members. Westfield CC membership: $40 per year. If paying by a check, please make it payable to Westfield Chess Club. Prizes: $60 to 1st in each quad. No advance or phone registration. Rounds: 12:15, 2:10 and 4:05 p.m. Note: Game pairings may not adhere to the Crenshaw-Berger Table. Westfield, NJ 07090. 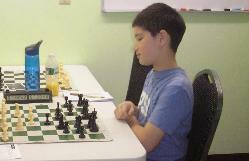 We are USCF-affiliated and run rated tournaments almost every week.